Accompanying the story is a photo gallery, related stories and resources like this two-minute video animation that describes the process of hydraulic fracturing by zooming in on a well that is extracting shale oil from the Bakken Shale play in North Dakota. On a related note, check out this image of the Earth at night that reveals “nighttime evidence of an oil boom” in this region of North Dakota. The Earth System Science (ESS) module Fracking – Marcellus Shale from the Earth System Science Education Alliance (ESSEA) is a Problem-Based Learning (PBL) activity designed to introduce your students to a current environmental issue and explore it using ESS’s Earth System Science Analysis (ESSA). The ESSA approach asks students to examine how the lithosphere, hydrosphere, atmosphere, and biosphere 1) are impacted by the issue; 2) affect the issue; and 3) affect each other. The module contains an extensive list of high quality resources pertaining to fracking along with a compilation of suggested activities appropriate for a range of learners, from beginners to advanced. To learn more about using ESS modules in the K-12 classroom, click here. If you have used this resource with your students, please leave a comment! The National Energy Technology Laboratory (NETL) has an information portal for the National Methane Hydrate R&D Program. There is a link to 24 page primer titled, Energy Resource Potential for Methane Hydrate (pdf) and a description of all active and completed research projects. 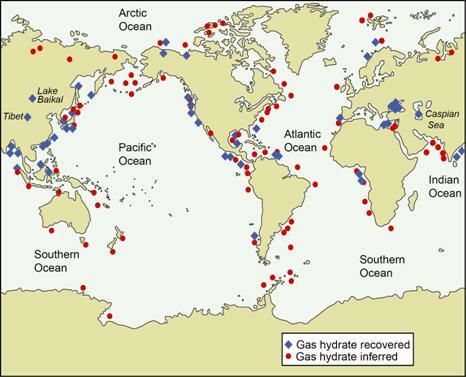 The USGS’s Woods Hole Science Center also has an extensive page devoted to gas hydrates. Here you can learn about The U.S. Geological Survey Gas Hydrates Project, learn about climate-hydrate interactions, and find links to recent scientific publications and multi-media coverage. Methane hydrates have been in the news lately after Japan announced in March that it had extracted natural gas from deep in the ocean floor! The source of the natural gas was methane hydrates, or methane molecules trapped in ice crystals. In reading a recent National Geographic article, I learned that “methane hydrates buried beneath the seafloor on continental shelves and under the Arctic permafrost are likely the world’s largest store of carbon-based fuel. The figure often cited, 700,000 trillion cubic feet of methane trapped in hydrates, is a staggering sum that would exceed the energy content of all oil, coal, and other natural gas reserves known on Earth.” Wow. 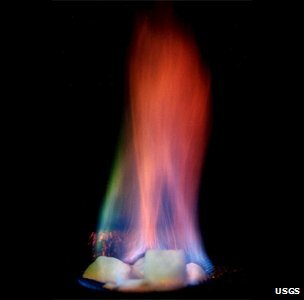 The Green Grok: Methane Hydrates: The Next Natural Gas Boom? I recently learned about a project from Circle of Blue called ChokePoint: US, a four-month reporting project where journalists set out to better understand what is occurring in the places where rising energy demand collides with diminishing supplies of fresh water. Check out the website for featured stories, multimedia and infographics about hydropower, coal, oil, tar sands, fracking, and renewables. Check out the interactive infographic titled: Energy Used in the Water Cycle that details the amount of electricity that is needed to transport, distribute and treat the water we use in our homes and businesses as well as the industrial and agricultural sectors. While electricity plays a role in many steps of this water cycle, most electricity use occurs with the end users – customers who heat water to bathe, cook, etc. For those of you who take your students on tours of water treatment plants or waste water treatment plants, consider asking the plant operators to discuss the plant’s use of electricity to pump, move and treat water. According to Dr. Kenneth Taylor, chief of the N.C. Geological Survey, in today’s press release from the NC Department of Environment and Natural Resources (NCDENR), the USGS mean estimate of 1.66 trillion cubic feet for natural gas could meet the state’s natural gas demand for 5.6 years, based on the 2010 average daily natural gas consumption volume in North Carolina of 811 million cubic feet per day. Today, officials from the N.C. Department of Environment and Natural Resources (NCDENR) released changes made to the outline for a study of the potential environmental and economic impacts of shale gas exploration and development in North Carolina based on public comments received in the fall of 2011. • Adding a section on potential impacts to North Carolina energy consumers. The NCDENR shale gas webpage provides an overview of shale gas; describes current regulations associated with shale gas exploration; explains how the department will study the issue (and provide study results when complete); and guides the public in how to receive updates on the study, as well as how to provide comment on the issue.